A big thanks to Gaming-Grizzly for the information in the video above. In this guide, we’ll go over seven easy ways to earn gold bars in Life After. Let’s start off with the first method. All you have to do is go to your camp and check out one of the TVs, click on the shopping channel, and in the top right corner, you can go to the Trade City. If you aren’t in the camp yet then go to Hope 101 and visit the market. In the market, you can buy and trade items with other players. What you want to do is looking for an item and figure out how much the general going price is. Once you do that you want to start farming that item until you have a stockpile of it. 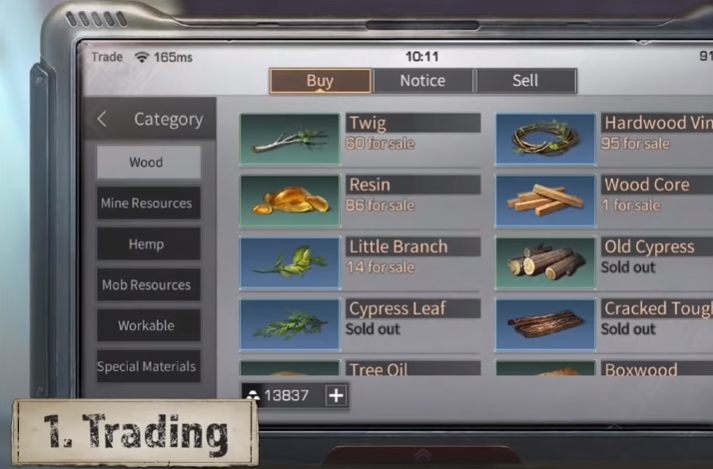 In the video, it shows Wood Cores as the item but it can be done with any farmable item. What you start farming should depend on the profession you chose as well. If you are a Logger then you definitely want to farm wood. Once you’re done farming you can go to the manor and check your mailbox. The items you were farming should be there waiting for you. Then after that, you go back to the camp or the market and sell the items for gold bars. To get the best time out of getting your gold make sure you check the last transaction price on that item and set yours just a bit below it. If you set your price too high it may take a while for you to get any buyers. Once you’ve sold your items your exchange prizes will be sent to your mailbox. About every hour in certain zones there will be special events that take place. 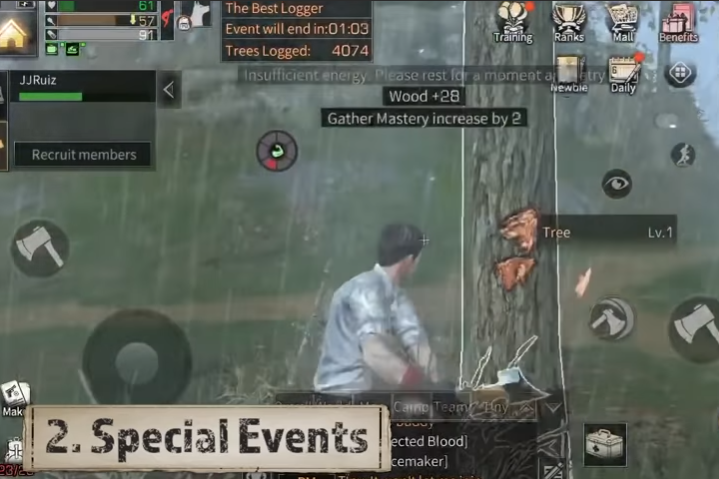 The event shown in the video is a Logger event where you have to knock down as many trees as possible. You want to make sure you’re equipped well before doing events. Make sure you have a full stomach and gather all the tools and food you need beforehand. When you complete the event you will be rewarded with gold bars depending on how high you rank in the event. So if you’re really good at certain events and dedicated you can get the top ranking easily. This sounds obvious but a lot of people forget about daily missions. You can play daily missions in different zones as soon as you unlock them. You can get gold from every single zone in one day. So if you have five zones unlocked then you can get gold from daily missions five times. Daily missions can vary between several things. From hunting animals and zombies to chopping trees or gathering stones. And once you finish the last mission you will get five hundred gold bars. If you open up the tablet you can see a section called Exploration. 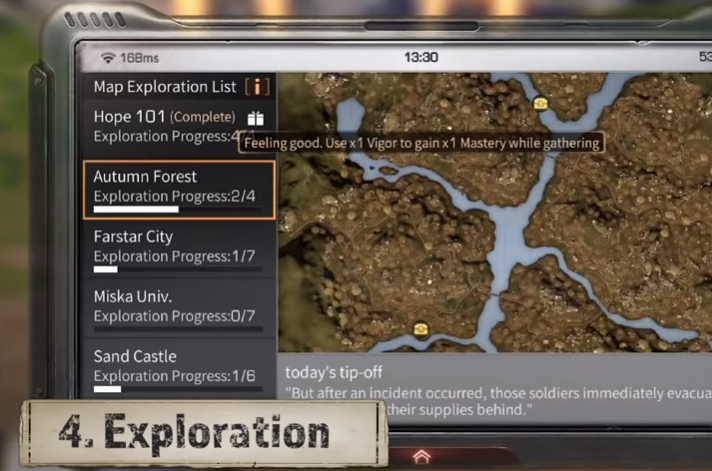 In this section, you will find the areas and their exploration progress. By exploring areas you can obtain gold bars by completing different areas. There are different boxes in each area you have to find in order to complete the exploration for each area. The video above shows the needed boxes for completing Hope 101’s exploration progress. When completed you can obtain 1000 gold bars. Next method is to be in the camp patrol. 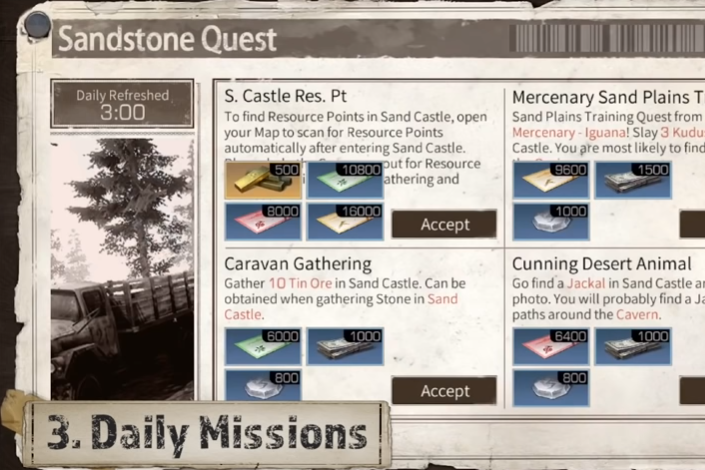 In the camp, you can visit a notice board and see two different types of missions. You’re going for a camp patrol which is only available between 8-10PM. You can get a few things from doing patrol but mostly gold bars. You have to kill zombies and animals to make sure the camp is safe. You will be given three different tasks that you have to complete in order to complete the mission. 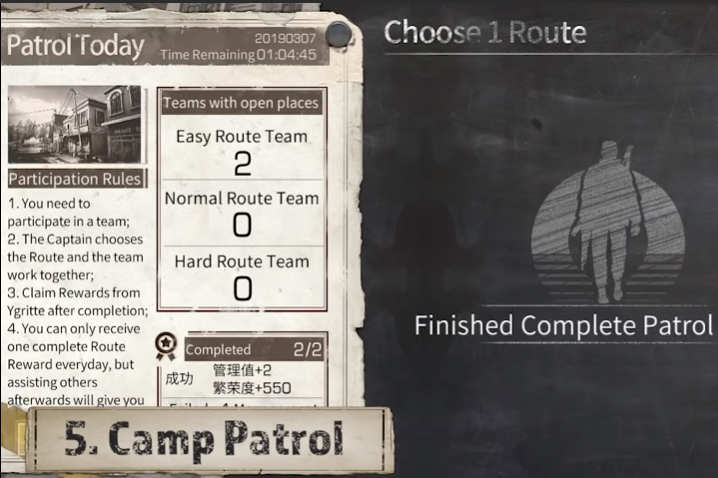 Before starting the patrol mission you can select a difficulty. The higher the difficulty you pick the more gold you can obtain. All you have to do here is open up your tablet and scroll until you see Achievements. 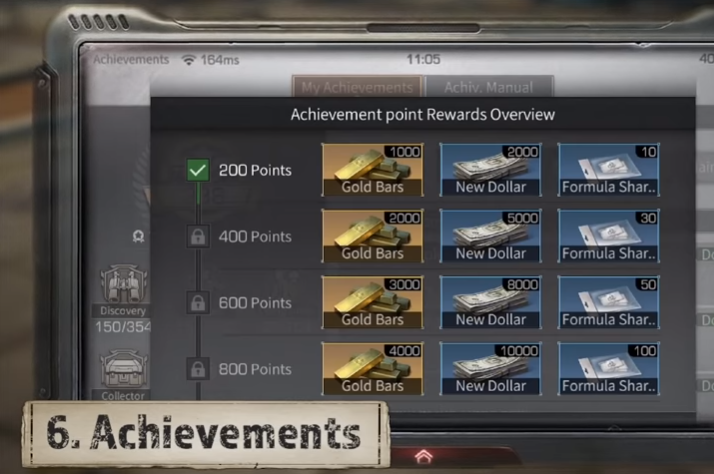 In there you can view the rewards you can get by completing achievements. By doing these you can obtain gold bars. There are several different achievements and some are more difficult than others. It goes up in points and the more points you go up the higher the rewards you’re going to get. If you click on the benefit icon you will see the sign in rewards for each day. But on the left side, there is a tab for Formula R&D. 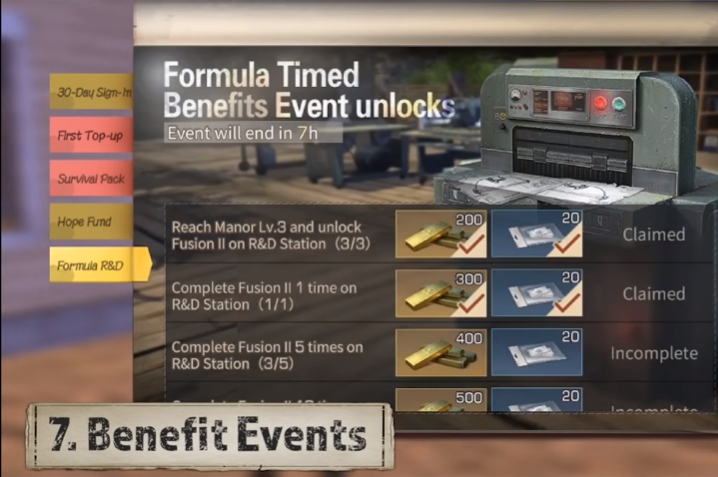 In this tab, you can see the benefits event. For this, you have to complete fusions in order to obtain rewards from the event. Always be sure to check for timed events and do them. You can get decent chunks of gold this way.